On his journey up the Rhine in 1774 with Basedow and Lavater the three stopped at two Mennonite homes at Neuwied in the Palatinate, namely, the minister, Lorenz Friedenreich, and the noted clock-maker, Peter Kinzing. Lavater's diary makes interesting comment on the personality of the Mennonites. 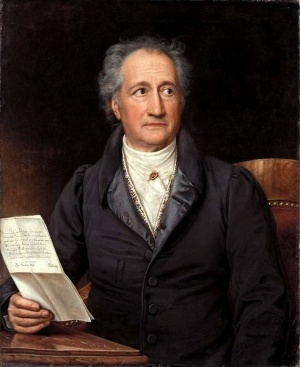 Goethe had some contact with Mennonites during his service as Minister of Economics in the government of Duke Karl August of Saxe-Weimar, when the latter attempted to establish Mennonite farmers on his land to improve agriculture. The matter of Goethe and the Mennonites needs further inquiry. For further information on the contacts mentioned, see the items in the Bibliography. Bach, Adolf, ed. Goethes Rheinreise mit Lavater und Basedow im Sommer 1774. Zurich, 1923: 119. Correll, Ernst. Das Schweizerische Täufermennonitentum. Tübingen, 1925: 130 f.
Crous, Ernst. "Lavater, Basedow und Goethe bei den Mennoniten in Neuwied." Mennonitische Blätter (1930): 107. Bender, Elizabeth Horsch. "Goethe, Johann Wolfgang von (1749-1832)." Global Anabaptist Mennonite Encyclopedia Online. 1959. Web. 20 Apr 2019. http://gameo.org/index.php?title=Goethe,_Johann_Wolfgang_von_(1749-1832)&oldid=94856. Bender, Elizabeth Horsch. (1959). Goethe, Johann Wolfgang von (1749-1832). Global Anabaptist Mennonite Encyclopedia Online. Retrieved 20 April 2019, from http://gameo.org/index.php?title=Goethe,_Johann_Wolfgang_von_(1749-1832)&oldid=94856. Adapted by permission of Herald Press, Harrisonburg, Virginia, from Mennonite Encyclopedia, Vol. 4, p. 1140. All rights reserved.